Ayurvedic diet is not about eating Indian food. It is about understanding the energy of food. Western food can be Ayurvedic when eaten in accordance with your constitution (Dosha); season; time of day; and in proper combination (See Ayurvedic food combinations; Fast food; and Ayurvedic diet and eating habits). The Ayurvedic view of dairy products is quite different from the prevalent point of view. Whole milk is regarded as excellent food for maintaining health, promoting longevity and spiritual growth. Milk and milk products are the most blessed foods because it is the pure love that the cow exreriences toward her calf. Unlike other animal products it does not have the energy of violence, which is dulling for the mind. Milk products are recommended for everyone: the young, the elderly, and anyone who is debilitated or needing strength. Many yogis take to a predominantly milk diet for extended periods of time. Ayurveda considers milk to nourish all seven tissues (dhatus) and to be especially good for the reproductive system. Most rejuvenating herbs are given with milk or Ghee (clarified butter). Use of hormones and antibiotics, pasteurizing, homogenizing, and long – term refrigeration of milk changes the enzyme structure in a way that makes it almost impossible to digest. Low – fat milk products can’t be digested and have been linked to a number of different diseases. Poorly prepared dairy products from badly treated cows taken cold and in bad combinations at the wrong time increase mucus in the system and promote food and sinus allergies and candida. – Buy organic RAW whole milk from cows raised under gentle conditions. – Boil it immediately, let it cool, and refrigerate. Boiling changes the enzyme structure to make the milk more digestible. 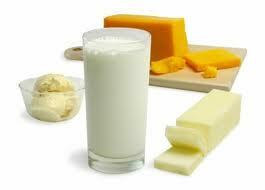 – If you believe you need low fat milk simply add as much water to the whole milk as you desire. It will decrease the fat content of your milk by keeping it digestible. Just remember that milk must have at least 2% fat for the gallbladder to release the bile needed for its assimilation. – Milk should be taken warm, not cold as it increases its mucus forming properties and encourages the formation of toxins. – Boiling milk with spices like cardamom, cinnamon, ginger, nutmeg, and cloves makes milk even easier to digest. Milk is usually best taken alone or as a meal by itself. You can also combine it with whole grains. – Dairy products do not combine well with sour fruits and berries, bananas, melons, eggs, bread with yeast, beans, nuts, fish, meat, potatoes, tomatoes, eggplant, radish, and yogurt. Melon, yogurt, and banana with milk are the most difficult combinations. – If you don’t have access to raw and/or organic milk choose the milk with the shortest storage term and not homogenized. Using dried whole milk and condensed sweetened milk is better than not drinking milk at all. – Yogurt as it is known here is heavy and mucus forming and also promotes weight gain, not the weight loss it is thought to promote. Yogurt combines poorly with fruits and nuts. Lassi – the Indian variety of yogurt has the opposite qualities and not only tastes great but promotes better digestion when taken after meals (see simple recipe for home made Lassi). – Warm milk taken before bed is a mild sedative to promote sleep. Its calming effect is increased by preparing it with a little nutmeg, about ¼ teaspoon per cup. TODAY’S TIP: Vedic knowledge states that food affects not only our gross body but the subtle body as well. Some food awakes sattvic (righteous) qualities such as kindness, modesty and prudence. Rice, honey, fruits, and milk are some examples. Some food is rajasic (passionate), for example yeast, pickles, olives, and vinegar. The others are tamasic (ignorant) : alcohol, garlic, hot pepper, left overs, ice cream. You can find a more detailed list in (How food affects the mind).